Browse: Home / Grace / Bound by the Old Law? 16 Let no man therefore judge you in meat, or in drink, or in respect of any holyday, or of the new moon, or of the Sabbath days. Verse 14 says that Jesus blotted out; here Paul uses an Old Testament term that was used to describe sins being blotted out. Paul uses the term here to say that the old law has been blotted out; the handwriting of the ordinances that was against us. The old law could not be lived up to and was contrary to us. Jesus took it out of the way, nailing it to His cross. The old law no longer accuses the sinner. This chapter in Colossians, when viewed in context is a very insightful chapter on the relationship of the old law to the Christian. The Holy Spirit is adamant as He relates His message through Paul that the Old Law was nailed to the cross. The feasts and the Sabbath were part of the old law that stood to accuse us of transgression. Jesus nailed this old law along with the feasts and Sabbath to His cross. If Jesus nailed them to his cross, thereby taking them out of the way, then who are we to drudge the old law up again and judge others concerning the Sabbath and the feasts? Ephesians 2:13 – 15 13 But now in Christ Jesus ye who sometimes were far off are made nigh by the blood of Christ. In this text we see that Paul is talking first to Gentiles and he is saying that we who were far off are now made close by the blood of Christ. He continues to say that Jesus is our peace. He is our peace in that He brought peace between God and man through and by His death on the cross. He also brought peace, specifically in this text, between Jew and Gentile, by making us one. He broke down the wall of separation that was between us. Continuing with the text, Christ Jesus abolished, destroyed; Jesus ended the observance of the Old Law. By so doing He made two, Jew and Gentile, into one, the body of Christ or His church. He abolished the Old Law and formed His church in His flesh, or by this death on the cross. Again, if this Old Law has been abolished by Christ, then who are we to drudge up the Old Law again and judge others concerning its ordinances? Just before His ascension to Heaven, Jesus began instructing the eleven with the words in Luke 24:44. Then He opened their understanding, that they might understand the scriptures. We are not told what scriptures He expounded upon at this time, but I’m guessing He quoted the 22nd Psalm, which prophecies that His feet and hands would be pierced and that He could see his bones, which would be the result of the lashings before the crucifixion. I suppose He explained to them Isaiah 53, “But he was wounded for our transgressions, he was bruised for our iniquities: the chastisement of our peace was upon him; and with his stripes we are healed”. Jesus explained to them that ALL had been fulfilled which was written of Him in the Law of Moses, in the prophets and in the psalms. Of course He fulfilled the law by being the perfect sacrifice and taking away or sin. The blood of animals would cover sins for a season, but the blood of Jesus removes the believer’s sin completely. In this verse we see that the law served a purpose until the seed should come to whom the promise was made. This seed, when the context is examined, is obviously Christ Jesus. Verse 21 of this chapter says, “If there had been a law given which could have given life, verily righteousness should have been by the law”. So the law never provided righteousness, showing that the law did not serve the purpose of making one right with God. If the law couldn’t make a sinner right with God, then what was its purpose? The 24th verse of Galatians 3 tells us, “Wherefore the law was our schoolmaster to bring us unto Christ, that we might be justified by faith”. So the law served as a schoolmaster to bring us unto Christ, or to evangelize us, or to bear witness to us. How so? The law shows us our deficiencies and shortcomings and points us to a Savior who can take away our sin and make us righteous or right with God. The 23rd verse of this same chapter says, “But before faith came, we were kept under the law, shut up unto the faith which should afterwards be revealed”. This verse is very plain, but I would like to expound on it just a little bit. While we were under the law we were shut up unto the faith, in other words the law kept us from faith which should afterwards be revealed. Many Christians these days are saved and are free from sin and are enjoying faith in Christ, but then for some reason they return to law. Why return to the schoolmaster that does not save? Why return to a system that NEVER saved one person’s soul? Why return to milk as babes when Jesus wants you to chew on the fat of the gospel? How much of the law do you wish to go by? Will you sacrifice? Will you worship on the Sabbath? Will you become circumcised, if you are not already? Practicing law is to turn one’s back on a Savior so dear that He bled and died for you. Practicing law is to say to that Savior that you can save yourself and you don’t need His righteousness. 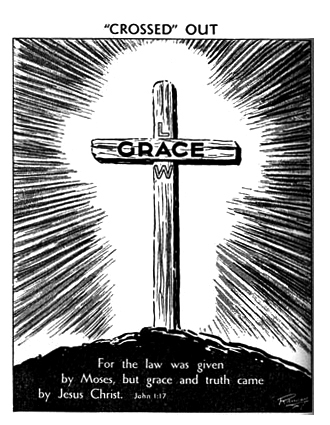 Practicing law places one outside of grace, for the law does not save and has never saved. 1Cr 16:2 Upon the first day of the week let every one of you lay by him in store, as God hath prospered him, that there be no gatherings when I come.